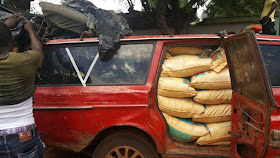 Thirty seven (37) vehicles loaded with illegally imported rice have been seized by operatives of the Nigeria Customs while on patrol in Ogun State along Ipokia, Idiroko/Oowode and Alari/Ifiyintedo axis. 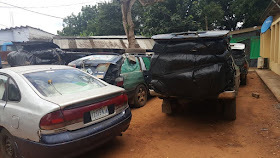 Speaking with newsmen in Lagos, Deputy Comptroller in Charge of Enforcement at the Command, Mohammed Gagiyo said the vehicles were intercepted and seized while three suspects have been arrested in connection with the seizure. The suspects, Olowe Oluwabunmi (m), Bibilari Olaniyi (m) and Rasheed Abiola (m) are currently being investigated in connection with the seizure. DC Mohammed reiterated the Service determination to continue its collaborative efforts with other government agencies to rid the country of cross border trade malpractices and smuggling. 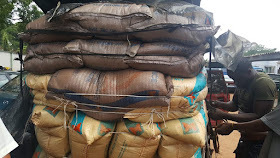 He also used the medium to inform the public that the ban on importation of rice through the land borders is still enforced.